There is a great deal of confusion today about what the roles of men and women should be. This book offers clear, easy-to-read, biblical teaching on the complementary differences between men and women, and explores how it plays out in family and church life. 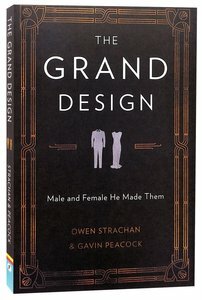 About "The Grand Design: Male and Female He Made Them"
:Understanding the Bible's teachings on the complementary differences between men and women, created equally in the image of God, reaches ultimately to the heart of the Gospel.Owen Strachan and Gavin Peacock bring to you clear, accessible and Biblical teaching on The Grand Design, exploring what Biblical complementarity looks like and how it plays out in our family and church life.